I spent the other night listening to my favorite performance artist Ask a Chola on her brand new radio show. Between the gully banter and crazy music I loved every second of it. I wanted to do what I could to support Chola’s new endeavor so I thought I’d create a new portrait to help get the word out. My first portrait of Ask a Chola, circa March 2007, is a good marker for how far my technical skills in illustration have evolved. I wonder sometimes if I’ve gotten too far away from my original style but I’m really happy with the direction the tablet has taken me in. There’s even a noticeable difference from my first couple of piece with it. Things are looking up! Alas, I’m triste because I’ll be in LA next Wednesday and will be away from a computer to listen to the show with. Someone will need to fill me in on the jams Chola throws and if there are any more breathless phone calls from the mysterious Anonima. 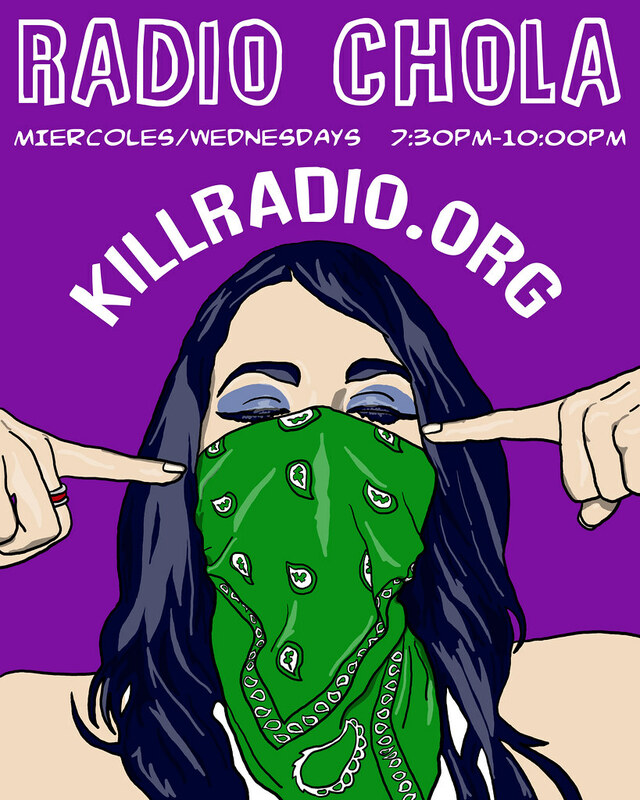 Radio Chola airs Wednesdays from 7:30pm to 10:00pm at Kill Radio.